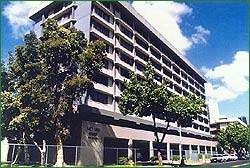 Salt Lake Manor is a 70-unit condominium conversion in Salt Lake, Honolulu that was completed in 1992. The building was originally built as an apartment building and Abe Lee Development Inc. in partnership with ILC International, Pat Doi and EM International successfully converted the building to a condominium. Abe Lee Development Inc. was responsible for the condominium process and lending overall guidance to the conversion. The building was renovated and each unit had new carpets, paint, cabinets and plumbing fixtures as needed. The ceiling had traces of asbestos and all of the units were encapsulated as approved by the EPA regulations. Most of the buyers were owner occupants. The sales prices ranged from $135,000 to $175,000 for one bedroom, two bedroom and three bedrooms.